Escoveitched is also another quick and easy way to prepare fish. 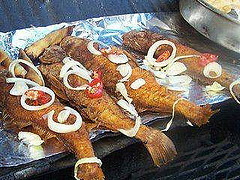 This method of cooking the fish is the all-time favorite way that I (and most Jamaicans) prefer to prepare our fish. New! I have a video with my sister making escoveitched fish. You can take a look at it here. • Put fish to drain on paper towel and make a diagonal cut on each side of the fish. • Place oil in frying pan to heat. • Crush the garlic and whole hot pepper and place in the frying pan, while the oil is being heating. • While oil is being heated, rub seasoning in the fish cavity, and on the outside, make sure to season thoroughly. Add slices of pepper, onion, and carrots tp add additional garnishing. Now serve fish with your favorite side dish, and enjoy. 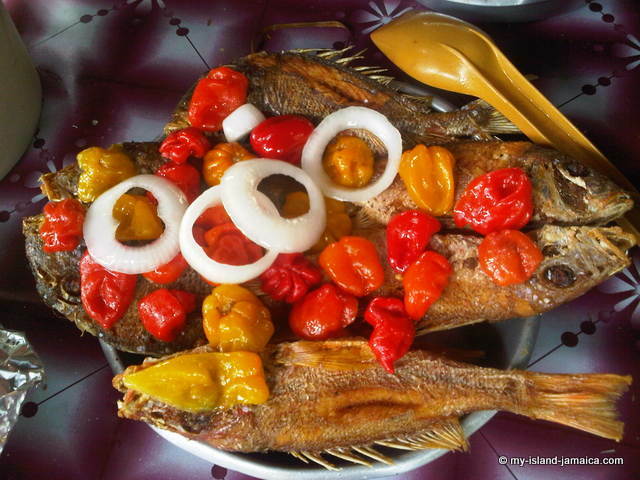 Escoveitched fish is typically served here with a few slices of bread, festival, fried breadfruit or bammy. When escoveitched the fish boast a lot of flavor, seasoning and spices, that makes it mouthwatering. And by the way, even persons who are not big fish lovers would tell you that perhaps their choice would be escoveitched fish. Do enjoy and please share; the links to share are below.